The catalog says that, “Delaney superimposed a calligraphic outline on the abstract composition of reds, greens, yellows and blues. Filled with all the colors of a flame, this incendiary, combustible background peers through Baldwin’s form…” This language seems to me to greatly simplify what I can tell even from reproductions of the work, which is that the colors shift dramatically between the ground and the figure, that the background does not merely “peer through,” but is transformed, condensed, reconstituted in and by the person. 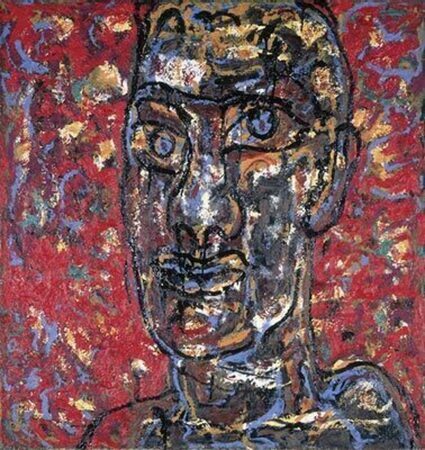 I find it hard to understand the eyes in this painting. In Paris, Monique Y. 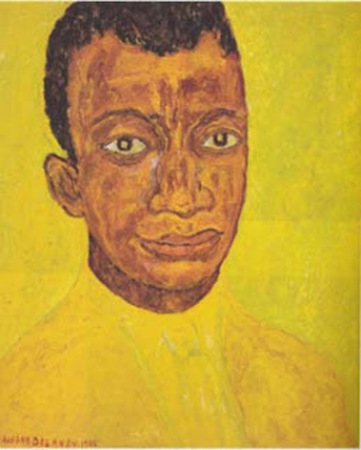 Wells maintains a wonderful website called Les Amis du Beauford Delaney, an important resource, and she has two entries on Delaney’s portraits of his friend James Baldwin. This was one of the most significant friendships of either man’s life. 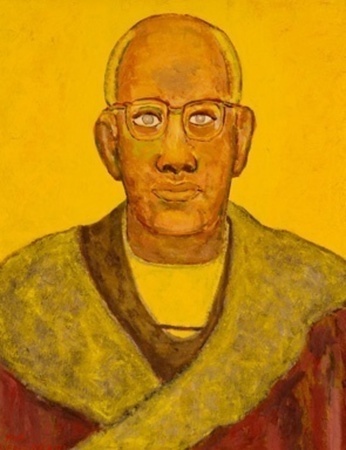 On the site, the art historian Catherine St. John offered comments on another portrait of Baldwin, this one backed in Delaney’s signature yellow. There is much to be said, and much has been said, on the metaphysics of inward light in Delaney (and in Baldwin) but here I want to confine myself to one observation, which is that the eyes, in some important way, do not have it. They seem in their dark opacity, or even in their dark brilliance, to reflect on light rather than to be lit. Like magnets, they also have darkness, and draw us by an absorbing force that pulls inward. And this seems very precisely understood. For the eyes would have to be the very site of inversion, the very place where the abstract meets the formed person, the lens across which the inner and outer worlds interpret one another. Here are two passages I've been struck by recently in reading John Dewey's Art as Experience. The problem of conferring esthetic quality upon all modes of production is a serious problem. But it is a human problem for human solution; not a problem incapable of solution because it is set by some unpassable gulf in human nature or in the nature of things. In an imperfect society -- and no society will ever be perfect -- fine art will be to some extent an escape from, or an adventitious decoration of, the main activities of living. But in a better-ordered society than that in which we live, an infinitely greater happiness than is now the case would attend all modes of production. We live in a world in which there is an immense amount of organization, but it is an external organization, not one of the ordering of a growing experience, one that involves, moreover, the whole of the live creature, toward a fulfilling conclusion. Works of art that are not remote from common life, that are widely enjoyed in a community, are signs of a unified collective life. But they are also marvelous aids in the creation of such a life. The remaking of the material of experience in the act of expression is not an isolated event confined to the artist and to a person here and there who happens to enjoy the work. In the degree in which art exercises its offfice, it is also a remaking of the experience of the community in the direction of greater order and unity. Art does not, in short, cease to be expressive because it renders in visible forms relations of things, without any more indication of the particulars that have the relations than is necessary to compose a whole. Every work of art "abstracts" in some degree from the particular traits of objects expressed. Otherwise, it would only, by means of exact imitation, create an illusion of the presence of the things themselves. The ultimate subject matter of a still life painting is highly "realistic" -- napery, pans, apples, bowls. But a still life by Chardin or Cezanne presents these materials in terms of relations of lines, planes and colors inherently enjoyed in perception. This re-ordering could not occur without some measure of "abstraction" from physical existence. Indeed, the very attempt to present three-dimensional objects on a two-dimensional plane demands abstraction from the usual conditions that exist. 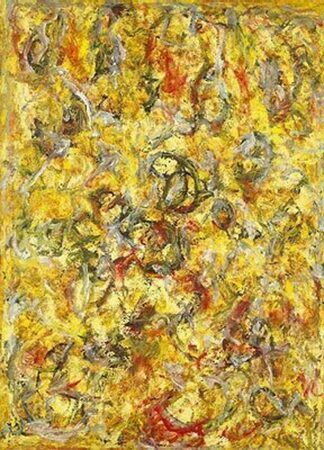 There is no a priori rule to decide how far abstraction may be carried.... There are still-lifes of Cezanne in which one of the objects is actually levitated. Yet the expressiveness of the whole to an observer with esthetic vision is enhanced not lowered. It carries further a trait which every one takes for granted in looking at a picture; namely, that no object in the picture is physically supported by any other. The support they give to one another lies in their respective contributions to the perceptual experience. Expression of the readiness of objects to move, although temporarily sustained in equilivrium, is intensified by abstraction from conditions that are physically and externally possible. I especially like "Expression of the readiness of objects to move."